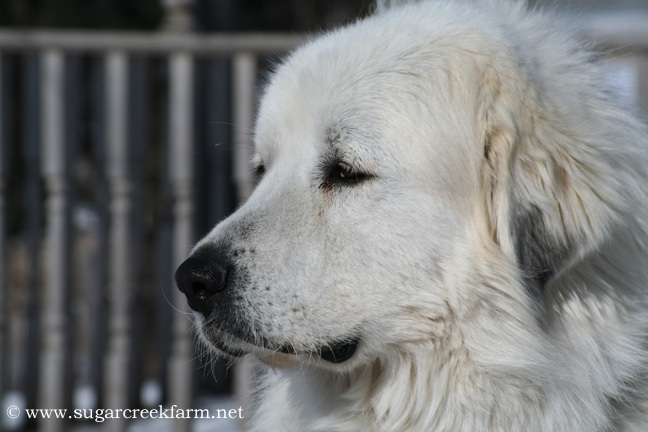 Here’s the other canine at SCF – Ike, our 4-year-old Great Pyrenees. We didn’t buy him for guarding livestock. We’d had a Pyr before (Ivan) and they just have such wonderful personalities and are fantastic with kids. But last year when we had a hawk problem we pressed him into service. I’m looking forward to trying that with him again this year. OH MY GOSH! Go Madeline! That’s priceless. Now THAT’s quick thinking. Wonderful video, great memory! I wanted to thank you for recommending the movie “King Corn.” My wife and daughter watched it with me, and they are starting to understand some of my enthusiasm. That video is a riot! You could tell that Ike was in on that plan, too!What a good team!